The 2014 regular session of the General Assembly is over but many of the bills passed in the last days are still on the Governor’s desk for signing into law or possibly a veto. If the Governor vetoes any bills there will be an automatic trailer session for the General Assembly to reconsider those bills. One of the more controversial issues this year as far as agriculture was concerned milk served to children in both public and private schools from day care centers through high school. One bill would have prohibited the serving of whole milk and 2% milk to children in day care centers and nursery schools because of the sugar content. It would have allowed the children to have skim milk and 1% milk. The sponsors of this bill were concerned that young children were becoming obese because of the whole milk they were drinking. This bill died on the Senate calendar when the General Assembly adjourned without acting on it. The other bill, which is now on the Governor’s desk, would prohibit serving chocolate milk in the schools through high school because of its sodium content. House bill 5566 was intended to make minor changes to the educations statutes but a last minute amendment would prohibit chocolate milk in the schools. Governor Malloy has received enough opposition to the ban on chocolate milk that his legal staff is checking to see if he can veto just the chocolate milk section or if he must veto the entire bill. 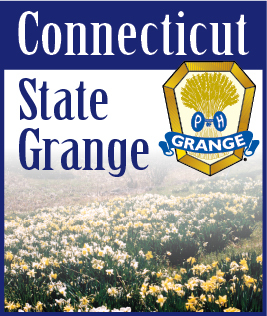 Last year at State Grange a resolution was introduced to provide more safety for people riding bicycles on rural roads. The resolution was modified to put all the responsibility on the bicycle riders rather than the motor vehicle operators. However, a bill was passed to put more responsibility on the motor vehicle operators. As I write this most of these bills are awaiting the Governor’s signature, so they are not yet law. However, other than the bill concerning milk in the schools, I expect the Governor will sign all of these bills into law. Unless the bill specifically has an effective date, all new laws become effective on October 1 following their passage. A number of legislators who have served for many years have announced they will not seek reelection this fall. Most likely representatives will give up their house seats to seek vacant seats in the senate. This means there will be a number of districts where no matter who wins the election there will be new senators or representatives. The Grange is strictly nonpartisan but we still encourage everyone, both members and nonmembers, to learn where each candidate stands on the issues and vote according to their own conscience.